Technical analysis of chart patterns is a tool widely used in the world of finance. Researchers make use of past market data, primarily price and volume, to forecast future trends. While some impugn the reliability of technical analysis, reality has repeatedly shown that it is a dependable tool. What it tells us about this year is far from good news. Technical analysis of financial market charts hints that stock prices will form a big multi-year top, which will be followed by the worst decline in years. The bear market will be sizeable and could last several years. Looking at the historical weekly charts of the S&P 500 index and the Dow Jones Industrial Average from 1990 until now, we can clearly see the formation of what is called in technical analysis a “broadening top” pattern. 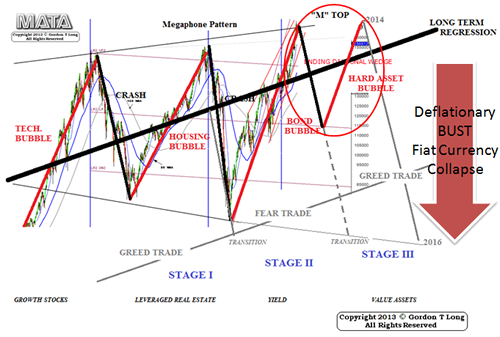 A broadening top, also known as a “megaphone pattern”, frequently occurs in the later part of an over-extended bull market. It comprises three peaks, each higher than the last, and, between them, two troughs, the second lower than the first. A broadening top ends with a long, steep drop after the third and last peak. The typical result is economic recession or depression. Analysis shows that most of the big crashes in stock markets in the past 100 years have followed this pattern. The trend is clear in both the S&P 500 and the Dow Jones Industrial Average charts. They show the biggest broadening top pattern seen over the past century, which has been developing for more than two decades. This broadening top trend seems to have begun its final climb this year. When it ends, stock prices are likely to plunge, deeply. There have already been two peaks and two troughs in this broadening top pattern. In the case of the S&P 500, the first climb started at 300 points in late 1990 and peaked at 1,527 points in early 2000. The index then fell, bottoming out at 801 points in late 2002, before climbing again to a peak of 1,562 points in late 2007. It then fell again, bottoming out at 683 in early 2009. It has been on the rebound since then. In the case of the Dow Jones Industrial Average, the first climb started just below 2,400 points in late 1990 and peaked at 11,723 points in 2000. The index then fell, bottoming out at 7,582 points in late 2002, before climbing to a peak of 14,093 points in late 2007. That was followed by a fall, bottoming out at 6,627 points in early 2009. Since then, the index has climbed. The broadening top pattern is moving towards its end as stock prices climb to reach their third and final peak. The trend suggests the Dow Jones Industrial Average will rise to 15,000 points – perhaps higher – and the S&P 500 to about 1,600 points in the months to come. The final climb typically inflates a stock price bubble. When the bubble bursts, it wipes out up to half of a stock market’s value. What is impressive and worrying about the present broadening top pattern is its size. Its disruptive power will probably do huge damage to financial markets. The ramifications are likely to shake up whole economies and even politics. Meanwhile, the bull markets for gold and silver persist, and the biggest rises in the prices of these metals are still ahead, as I have written here before. Precious metals will be one of the best investments in the coming years, especially in such a volatile financial environment.